The emission nebula M17 is a beautiful nebula in the constellation Sagittarius, about 5000 to 6000 light years distant. M17 is a beautiful view in amateur telescopes from dark sites, showing a lot in intricate detail. M17 is one of the brightest and most massive star-forming regions in the Milky Way. Many of the stars seen in and near M17 are hot young O and B-type stars, while most of the stars seen in the region are old cooler yellow to red stars, stars cooler than our sun. This is a natural color image. The high dynamic range of astrophotos must be stretched to bring out the range of details the camera recorded. But the typical image stretch process loses color for brighter subjects (e.g. stars and the brighter parts of deep sky objects become whiter as they are made brighter). This image uses a a new Rawtherapee raw conversion method, and a new algorithm, rnc-color-stretch that does not lose color during the stretch. How do we know the colors are reasonable? The star colors can be checked against stellar photometry. Red stars have B-V > 2, orange stars have B-V of 1 to about 2. The blue-white stars have B-V in the range of 0 to -0.5. The colors closely follow the color sequence in Table 1 at Color of Stars. Solar-type stars have a B-V of 0.63 and appear close to white (daylight white balance). 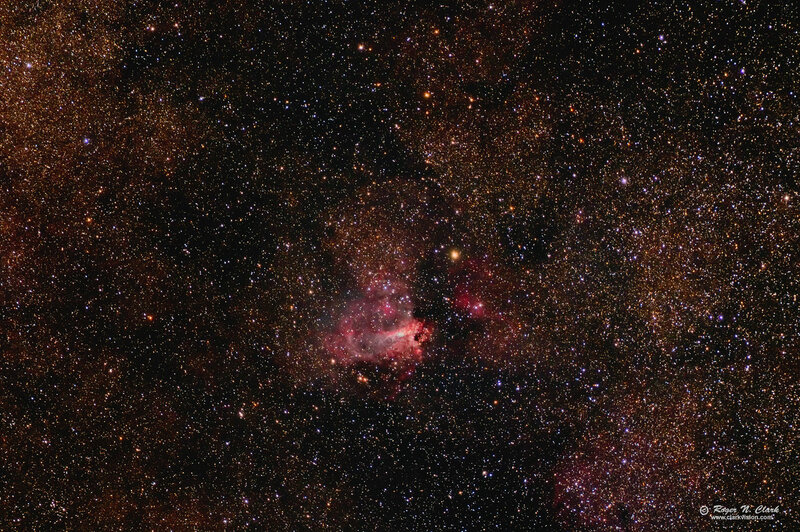 The color in M17 illustrates several compositional trends. Hydrogen emission nebulae are pink/magenta, and that color is common in the brighter parts of the nebula. The brightest part of the nebula is greenish (teal) from oxygen emission at 500.7 nm. Toward the edges of the nebula, the magenta color turns redder. The pink/magenta is a combination of H-alpha emission (red), H-beta (blue-green), and H-gamma (blue). Toward the edges of the nebula where the color is redder, interstellar dust absorbs the H-gamma and H-beta more than the H-alpha, turning the pink emission red. Throughout the region away from the nebula is interstellar dust, appearing burnt-orange. Technical. Canon 7D Mark II 20-megapixel digital camera and 300 mm f/2.8 L IS II at f/2.8 plus a 1.4x teleconverter giving 420 mm at f/4, ISO 3200. Twenty-one 30-second exposures at ISO 3200 were added (10.5 minutes total exposure). I would normally use ISO 1600 and 60-second exposures, but seeing was bad, the object was low in the sky, and it was breezy, so I shortened the exposure in case of camera shake and to try and catch moments of stable atmosphere. Full resolution image is at 2.0 arc-seconds per pixel, and the image here is 6.9 arc-seconds per pixel. No dark frame subtraction, no flat fields. Tracking with an astrotrac and no guiding. This image shows the full frame, no crop. CEFA = 7900 minutes-cm2-arc-seconds2 (2.0 arc-seconds / pixel).